For the last several years, we have heard from pest managers about European corn borer (ECB) infestations and damage catching the producer, or themselves, off guard when growing non-traited corn (e.g., popcorn, white corn, etc). This seems to occur more often when large acreage of unprotected corn is grown in close proximity. Though this pest has been in decline since the early 2000’s, when Bt-traited corn was becoming predominantly grown in the state, it is very obvious that their many other hosts, including weeds and vegetables, has kept them present…though low-key. Even more fascinating to us is younger field personnel are unfamiliar with this pest of old when encountered. It is not our intent with this newsletter article to cover complete ECB biology, damage, and management considerations, as this can still be found in many field crop pest management books sitting on the shelf. Primarily, our questions have been about how and when to monitor for this pest. For seasoned pest managers, they recall it was a complex and fickle pest, even in its “heyday” before Bt-corn, varying greatly in damage from year to year. It should be no surprise that for the past couple of decades, there has been virtually no advancement in monitoring and predicting this pest, as the necessity of this work and university research dollars to do it dried up. For years, we maintained and reported captures from a black light trapping network (placed at eight regional Purdue Ag Centers), ECB being one of many Lepidoptera species. As expected, as Bt corn acreage increased/expanded, ECB moth captures declined; many times they were nearly absent throughout the year. There are no plans to resurrect that trapping program. One important attribute of ECB biology, concerning monitoring, is that male and female moths mate at the appropriately-named “action sites” during the evening and night. Action sites are grassy areas outside of the field, examples being waterways and roadsides. In order to know early and peak flights of the moths, one must monitor during these times. ECB typically has two generations, historically mean flights are from May 26-June 10 for the first flight and July 26-August 14 for the second. 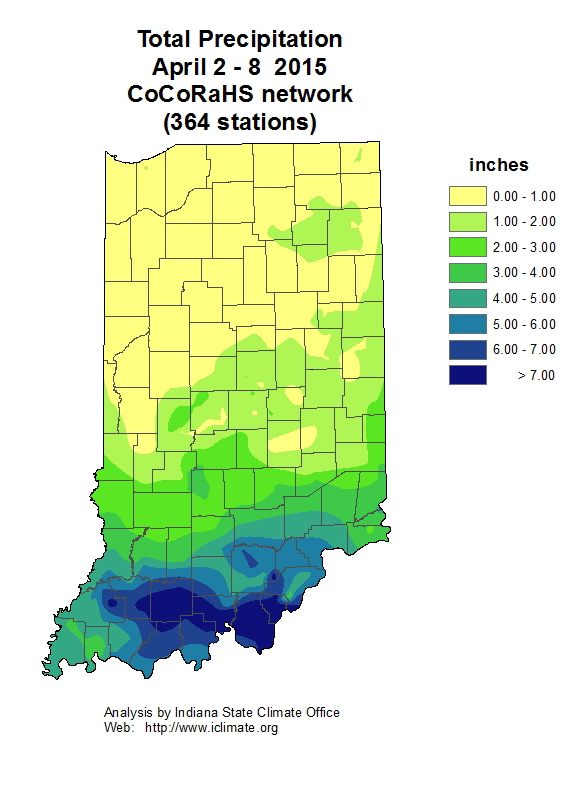 The range accounts for the developmental (heat) differences from southern to northern Indiana. To “ground-truth” these calendar dates, one can use black light and/or pheromone traps. The other less technical approach, but perfect for night-owls, is to drive farm lanes of the non-traited corn with your vehicle’s bright lights. Yes, you will see them flying around and eliminate a few on the windshield. A slight caution with this method, there are other insect species that can have massive night flights but are not a concern to crops, e.g., mayflies. Black light and pheromone traps (we have the Iowa strain in Indiana) both have their advantages and disadvantages. Traps need to be placed close to the crop of concern and checked daily, and the general rule is that more traps are better. Trapping for ECB is an art, not a science, and the important point is that trap catches are NOT PREDICTIVE of infestations and/or damage. The reality with any of the methods, even the night drive, is that you are gathering relative flight information to better time your scouting visits to the cornfields, ideally peak mating and egg-laying. Also, there are degree-day models available online to help track ECB development once you know moths are flying. Nonetheless, there are no shortcuts for scouting trips to determine egg laying and/or damage. ECB female moths are quite discerning about which field, and where in the field, they deposit their eggs. Meaning they will likely be clustered, rather than uniform, in a given field. If you have not had the pleasure, scouting for first-generation ECB is a walk-in-the-park compared to the second. With prior research and the tools developed, this new/old pest can be managed quite successfully. Depending on acreage involved, it may require personnel dedicated to understanding and monitoring for this pest. Some might consider hiring a crop consultant that provides such services. If you are contemplating the thought of planned rescue treatments without the monitoring, there are plenty of experienced field personnel that will tell you that it won’t work. The treatment window from egg hatch to larval boring is short, once in the stalk, control is not possible and they are safe. Happy scouting! Wild Garlic (Allium vineale) has shown up in many Indiana no-till corn and soybean fields this spring especially, in southern Indiana. Wild Garlic is most troublesome in wheat, where aerial bulblets contaminate harvested grain and impart the garlic flavor into processed products such as wheat flower. Infestations in corn and soybean fields have less adverse effects on the crop, but can spread quickly across fields and are difficult to control with typical burndown treatments of glyphosate and 2,4-D.
Management of wild garlic must occur early in the spring as this perennial will quickly become reproductive in mid to late spring. Wild garlic produces aerial bulblets and begins to senesce in late spring to early summer. As with all weeds, wild garlic management needs to occur prior to seed or in this case bulblet production to reduce future infestations. Ideally herbicide applications should take place in early April when the wild garlic is less than 12 inches tall and actively growing. To assure active growth is occurring make applications when daytime temperatures are consistently maintained at 60 degrees or higher. An additional challenge for herbicide application is the growth habit and leaf structure of wild garlic. The smooth, linear, and erect leaves of wild garlic can create difficulties in getting good spray coverage. Spray carrier volume has the greatest effect on herbicide coverage, and higher volumes should be considered when making applications to difficult to cover weeds such as wild garlic. A minimum of 15 gal/acre would be recommended for effective coverage of wild garlic. Typical spring no-till burndowns of glyphosate plus 2,4-D will only have marginal and variable control of wild garlic. The addition of thifensulfuron, thifensufluron plus tribenuron, or chlorimuron containing products to the glyphosate plus 2,4-D tank mix will provide additional and less variable control of wild garlic. Applications with higher rates of thifensulfuron will be most effective in controlling heavy infestations of wild garlic. Again as mentioned above these herbicide applications will be most beneficial when applied at the correct timing and with higher carrier volumes. Plant back restrictions for corn and soybean should be noted for the herbicide products applied. Products containing thifensulfuron and tribenuron can have plant back restrictions up to 45 days depending on product rates. Chlorimuron products are not labeled for use prior to corn planting. Always refer to the label for plantback restrictions. The list of products containing thifensufluron, thifensulfuron plus tribenuron, and chlorimuron is extensive and beyond the scope of this article. A list of products can be found in the 2015 Weed Control Guide for Ohio, Indiana, and Illinois https://mdc.itap.purdue.edu/item.asp?Item_Number=WS-16-W#.VR2hq2a16wzlink. Additional information for control of wild garlic in winter wheat can be found in the “Control of Problem Weeds” section (pg 170) of the 2015 Weed Control Guide. Star-of-Bethlehem is a weed that row crop producers may only rarely encounter, but it is certainly makes up for its rarity with its troublesome management. The perennial weed is an escaped horticultural plant that produces small, six-petal white flowers, and reproduces from underground bulbs. The glossy green leaves can look similar to wild garlic, but will remain about the half the height of wild garlic and lack the garlic smell. The underground bulb structures not only contribute to its reproduction, but also can reach high densities that interfere with spring planting operations. This perennial weed has likely already emerged in southern Indiana and can currently be observed emerging in northern Indiana. Like many troublesome bulbous perennial weeds, star-of-Bethlehem can be most prevalent in no-tillage fields. 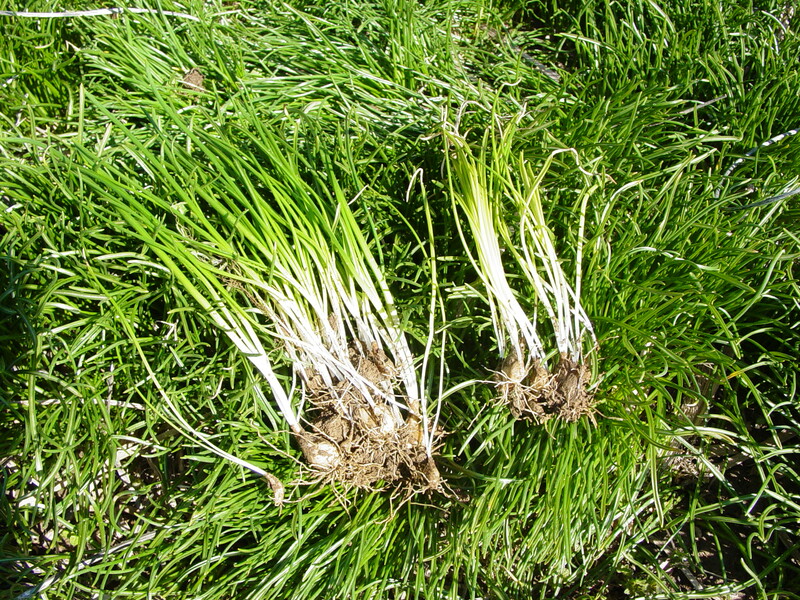 Management of star-of-Bethlehem should be conducted early in the spring and should focus on control of the underground bulbs. Tillage can control the vegetative growth in the spring, but is also likely to spread the bulbs throughout the field. Tillage is also likely to stimulate additional bulb production from bulbs cut by tillage equipment. There are a few herbicides that can provide vegetative burndown control, although control of the bulbs with herbicides is limited to Gramoxone. 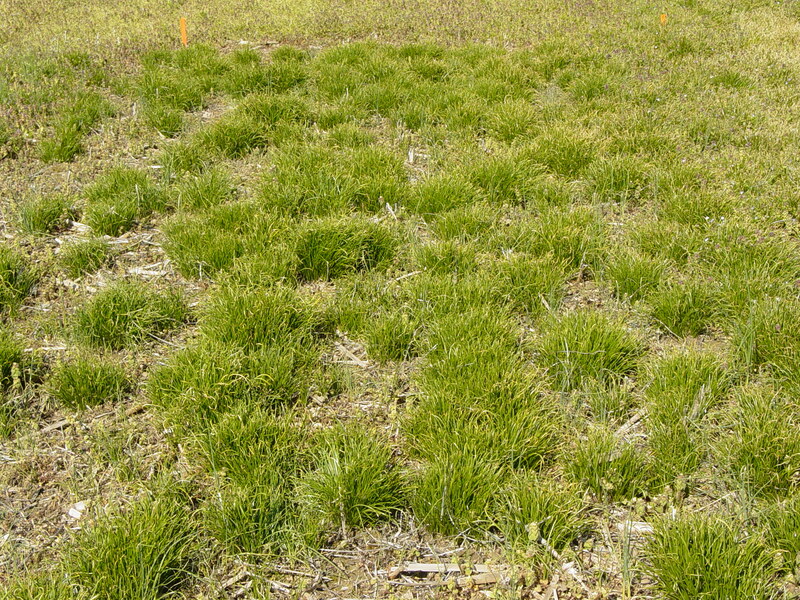 Research conducted at Southern Illinois University showed that Valor, Authority, and glyphosate can suppress Star-of-Bethlehem during the current season, although these products did not control bulbs as densities the following spring were not reduced. Gramoxone applied at 3 pt/Acre or 0.75 lb active/Acre provides the greatest amount of control for the current season as well as reducing bulb densities the following spring. Further SIU research has suggested that herbicide applications should be targeted at the vegetative stages when leaves are almost fully emerged and new underground bulbs are forming. 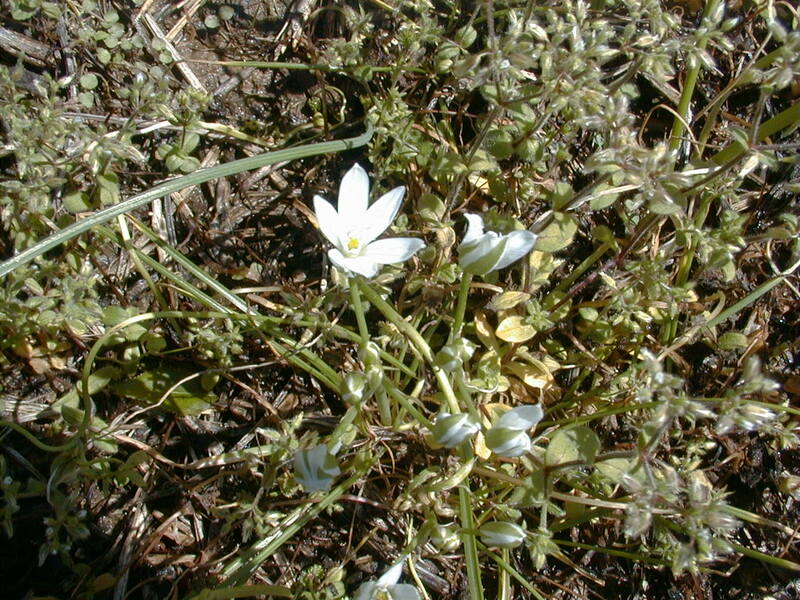 Further information on the weed Star-of-Bethlehem and control data from SIU research can be found in this fact sheet http://www.siu-weeds.com/publications/Star%20of%20Bethlehem.pdf. Figure 1. Star-of-Bethlehem infestation in an organic field. Figure 2. The waxy leaves and underground bulbs of Star-of-Bethlehem. Figure 3. The white six petal flower of Star-of-Bethlehem . If you would like to be alerted by e-mail when the current issue of the Pest&Crop is available on-line, please enter your e-mail address and click the submit button.